This app was previously called "Commit Policy Plugin for Bitbucket". It is still the same app you love, but it was renamed in Jan 2019. 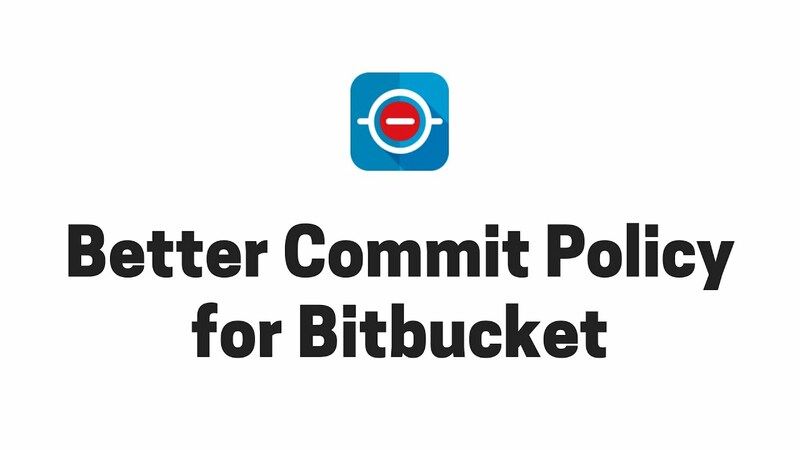 Better Commit Policy checks the changes committed to your Bitbucket against a set of configurable rules, the commit policy. How is it different from Better Commit Policy for Jira? It's simple: this app works by integrating the Better Commit Policy for Jira app with Bitbucket. While the Jira app is Version Control System independent (supports Git, Subversion, Mercurial among others), this app provides native Bitbucket experience utilizing pull requests, web based editing, application links and more. As a result of enforcing rules on the changes submitted to and on the pull requests merged in Bitbucket, the quality of your processes, the traceability of your changes and the consistency of your source code dramatically improve. In addition to pushing commits, merging pull requests are the other way to apply changes to the Bitbucket managed code. Better Commit Policy verifies pull requests just as rigorously as pushes. Merging is enabled only if all commits in the pull request satisfy the policy. Bitbucket supports creating branches and tags. Power Editor (a Bitbucket app) even allows creating commits via the web UI! All these changes are fully verified by Better Commit Policy. The integrity of your code is preserved, no matter where the changes are originated from. Your team members can use any standard-compliant Git client (command-line, GUI tools, IDE integrations) on any Operating System. For compliance reasons, we must ensure that every commit is associated with a valid Jira issue. This app allows us to satisfy that requirement. The support from Midori so far has been fantastic. I reported an issue and was promptly contacted by a senior developer who was able to identify the root cause of the problem and quickly provide a patch that resolved it. This app is a must-have to keep our repository clean. Its usage is as easy and intuitive as possible. This app is a key tool in our DevOps process. This app "just works". When I needed help, the support was really fast and good.